Link to us with these banners. If you want something special, let us know. Répondez s'il vous plaît. Please let us know who has linked to us, and we will send you a special easter egg. There are no fansites at this time. We're waiting with bated breath for the first one. Currently on hiatus while we work on Magniloquence. Being a Weekend Artist severely limits the time available for illustration. Ms. Hicks is a Canadian freelance artist who has made the transition from webcomics writer and illustrator to graphic novel artist. Eisner Award Winner, best publication for Kids ages 8-12. The Adventures of Superhero Girl is about the trials and tribulations of a young, cat-loving superheroine battling monsters and obnoxious people in an all-to-ordinary world. She suffers all the real world problems associated with laundry, limited income, sharing an apartment, an obnoxious and overshadowing older brother, and disappointed parents. 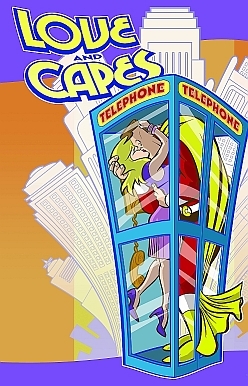 Originally serialized in THE COAST magazine in Canada, The Adventures of Superhero Girl was published on-line in the early 2000's and later in a full-colour hardcover edition currently available from Amazon or your local bookseller. Ms. Hicks more recent publications include: The Nameless City 1 and 2 [with 3 to be published in 2018], Bigfoot Boy, The Last of Us, Nothing Can Possibly Go Wrong, Friends with Boys, Brain Camp, and Zombies Calling. 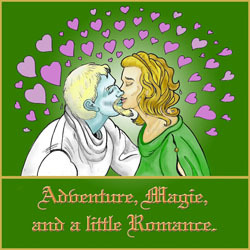 Love and Capes is the longest running superhero/normal person [Abby's normal?- well mostly] webcomic on the net. Mark is the Crusader, a Superman style superhero, and Abby runs a book store. There is alot of conflict in their lifestyles and goals. How does one have a normal relationship when one of them gets called away during a date to save the world? It is updated twice per week and has a large fan base. On the net, it has 1028+ comics. It is also in print in both comic format and in compilation format. The print version is several books ahead of the on-line format. Mr. Maihack's take on the Batgirl/Supergirl comic is amazing, fascinating, unique and utterly adorable as he addresses what they might be like as adolescents. Supergirl is loveable, manic, and loves changing costumes. Batgirl, her BFF, tries for dark and inscrutible --but the closest she can come to it is huffy or grumpy; which makes her adorable too. If they ever publish it, I would buy this series in a New York minute. To view the comics, click on the Comics link on his homepage and then the Batgirl/Supergirl link. Kelly Bastow, also known as Moosekleenex, is an up and coming Canadian illustrator. Her ink and wash illustrations and backgrounds are deceptively complex and darkly moody. She has had several successful posters widely distributed on the Internet [see above]. She has recently published a webcomic called Wax and Wane, with characters that grabbed me from the start and never let go. Ms. Decrock is a well known French "Illustratrice freelance" who draws simply lovely ladies. She is one of my favorite modern illustrators, utilizing soft pastels and interesting French backgrounds to produce some of the finest pinups of this generation. What is particularly intriguing is that these pinups are in natural poses, and that they are sensual without being sexual. I once asked my daughter to explain what was a sensual line? She replied by pointing to a series of Art Nouveau pictures and sculptures. Ms. Decrock has captured that Art Nouveau essence in her illustrations of today's women in modern settings and dress. She draws for Disney Girls Magazine and does Les Maximes de Sophie, a luxury attitude/customer experience/Sens du Service graphic art series. She is also a member of Masters of Anatomy, and illustrator of the graphic novel Street Girls. Savannah Alexandra, is a character designer and animator and illustrator speciallizing in character design, concept art, and 2D animation. As she says on her art blog, "she can't stop drawing cute things." She is absolutely correct. Due to her character design experience, Savannah has the knack of extracting the essence of a character and expressing it in her illustrations. I particularly like her series of deer-based Centaurettes. You can see them all on her tumblr art blog, on facebook, or on her website.